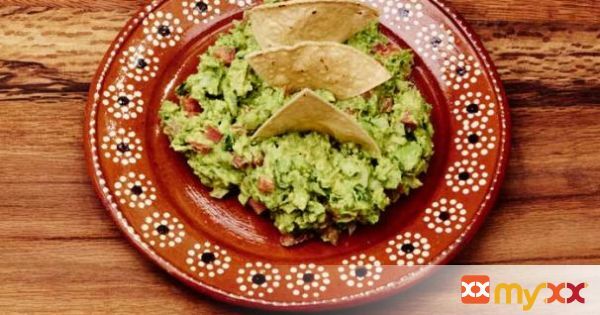 One Recipe, Two Methods of Preparation Guacamole can be prepared in two ways: with a bowl and fork or in the molcajete, a Mexican mortar end pestle. Making it in the molcajete gets the most incredible results. Let us show you both methods of preparation. 2. Remove the flesh of the avocados. 3. Mash the avocados with the back of a fork. 4. Add the other ingredients and incorporate evenly. 7. Add the chopped onion, serrano chile, cilantro and salt to the molcajete. 8. Grind until you have a smooth paste. 9. Add the avocados to the molcajete and grind until slightly chunky. 10. Add the tomatoes to the molcajete and incorporate. Do not grind the tomatoes.